My 2016 New Year’s weekend was spent once again in Highlands Hammock State Park in Sebring, Florida. For those of you who don’t remember, we spent last New Year’s at Highlands Hammock as well. Unlike last year, this year we camped in the “primitive” campground, which just means it does not have any water or electric hookup for RVs and it only has one solar-powered composting privy. We enjoyed our stay in the primitive campground so much more than when we stayed in the full campground. It was quiet, our campsite was extra large and the night sky was full of stars (that is, when it wasn’t raining – which you known has been happening a lot on my camping trips of late). I even brought my Flagology garden flag with me to mark my campsite; everybody loved it. We brought Daddy-dog’s new toy – the GoPro Hero 4 Session. 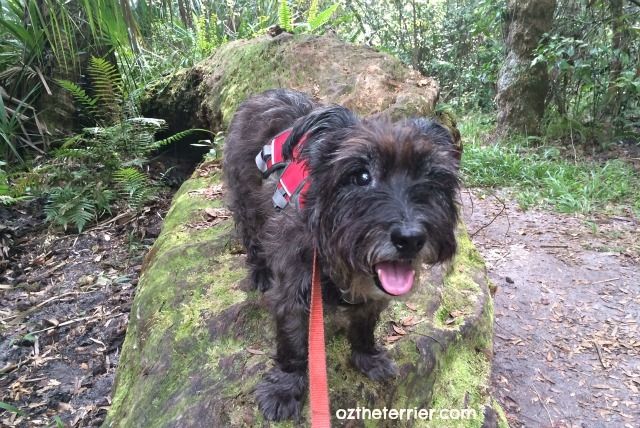 I am still getting used to wearing the GoPro dog harness and filming while hiking so we didn’t get any Oz footage of our hikes within the park. We hiked several trails though including the Virgin Hammock and Ancient Hammock trails where I found several downed trees to climb on; climbing is always fun. Daddy-dog did mount the GoPro to Ma’s bike one day and his bike the next day, so you could see us biking through the park to get to the hiking trailheads. When biking in Highlands Hammock, you ride on both the off-road sand trail as well as on a paved road; my Solvit Products HoundAbout II Trailer can handle both very well. 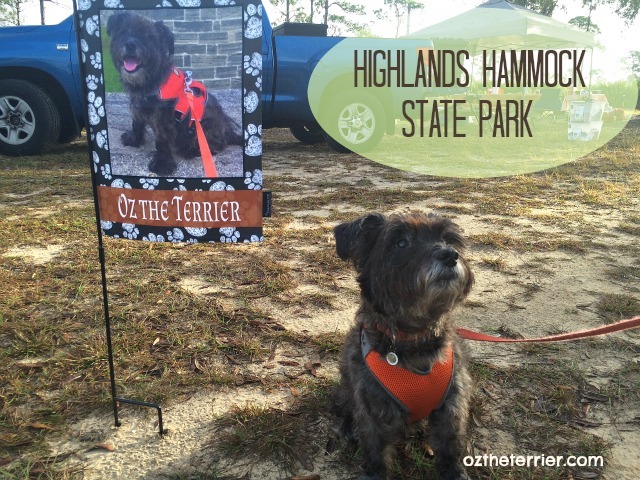 We were once again disappointed that we didn’t get to see most of the wildlife that calls Highlands Hammock State Park home. New Year’s weekend is a busy weekend, all the campsites were full, so we figure the animals would rather hide then venture out among all the people. 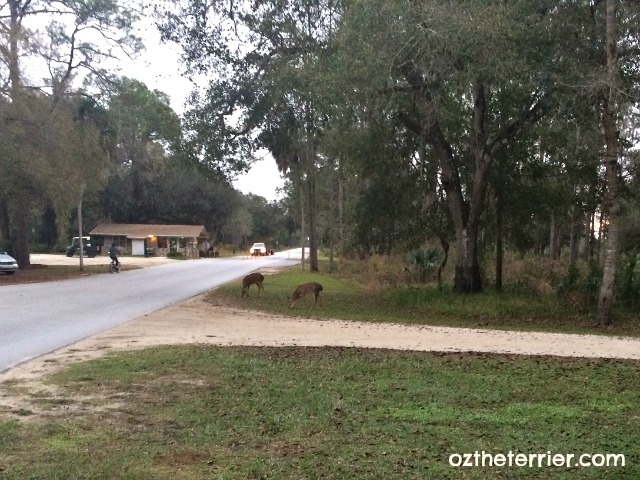 One early morning, on the way out of the primitive campground we did see a small family of deer. We kept our distance so we wouldn’t disturb them. I am, of course, looking forward to my next camping, hiking and biking adventure of 2016! I am hoping we can visit a new State Park possibly on the west coast of Florida. Did you start off your 2016 in a special way? I love seeing deer on walks. Even though we live in a pretty urban environment we still see deer from time to time. I'm glad you started the new year off in such a fun way! It's Sebring. Why walk when you can take a race car? We just loved your Daddy's video!! Mama has a Hero 4 that she uses for her underwater movies that she just loves!! We loved your flag also, we live very close to the state park, so we all kinds of animals venture out in the cold. Wow, what a pretty place for camping and hiking! I love your flag. I spent New Years with FnE...that was really fun. THIS was FUN and Exciting..
What a fun way to ring in the new year! I hope nopuppy peed on your flagpole! love your flag and the video! Oz I love your new flag. Thanks to Murphy and Stanley mom remembered she had not posted the flags she ordered for me and my nephew Frisco. Wow, does that look like a fun park! We'd love to go exploring there. Was that you in that little carry cart behind the bike, Oz? That is beyond ADORABLE! My New Years weekend was spent helping Mom take down Christmas decorations. The Go Pro seems to be working pretty well for you guys! Glad you had so much fun! That Go Pro is NICE! We like your flag too! We can't wait until it is camping season. Mom says probably in March we will go! That looks like a fun trip! We enjoyed your video too! Our mommy could never do primitive. Nope. She's one of those wusses you hear about! That looks so fun! Love the flag! I've lived in Florida for 32+ years and I never heard of that park.This Brooklyn girl is not into camping and anything without facilities. It might be fun for an afternoon hiking trip. I love to walk. We used to do a lot of primitive camping when our kids were small. There's a big payoff for carrying in all your gear. Same with backpacking (but I'm a wimp about getting a shower!). What a great trip, even if the wildlife was hiding. Your flag is way cool and that video rocked thanks for sharing your ride with us. That looks like a fabulous trip. Did any one have generators at the primitive campground.